I’m here in Quito, a short city bus ride from the Equator, El Mitad del Mundo: the Middle of the World. This being the tropics, with visions of steamy heat, jungles, humidity and all that goes with these notions, you’d think that this is what I’m contending with. And except for the humidity, you’d be totally wrong. I’m here at my desk wearing long-johns, a fleece vest over 2 sweatshirts, fingerless gloves, and a wool watch-cap, struggling to keep warm. Ah, the tropics! Tonight the South American Explorers Club, or SAEX (Quito branch) is hosting an Open House and I’m looking forward to being there. Of course meeting with 4-dozen expats, Ecuadorian nationals wanting to practice their English, German and British students just loving life, and cheap beer are incentives enough. But the clubhouse also has a wood fire burning in the living room fireplace and I really want that heat. The Open House is both a monthly fund-raiser for the non-profit Club and a very effective way to break down cultural barriers by providing a low-key venue for an international blend of the curious, the shy, the extroverts, the singles, and those pretending to be single, at least for one night. It was a pretty broad mix of ages, from 20-somethings to pensioners. There was even an octogenarian newspaper editor from a suburb of Albuquerque who was there visiting his son, married to an Ecuadoriana. I’ve already marked my calendar for next month. Next week (it’s now several days later) SAEX hired 2 Chiva vans. 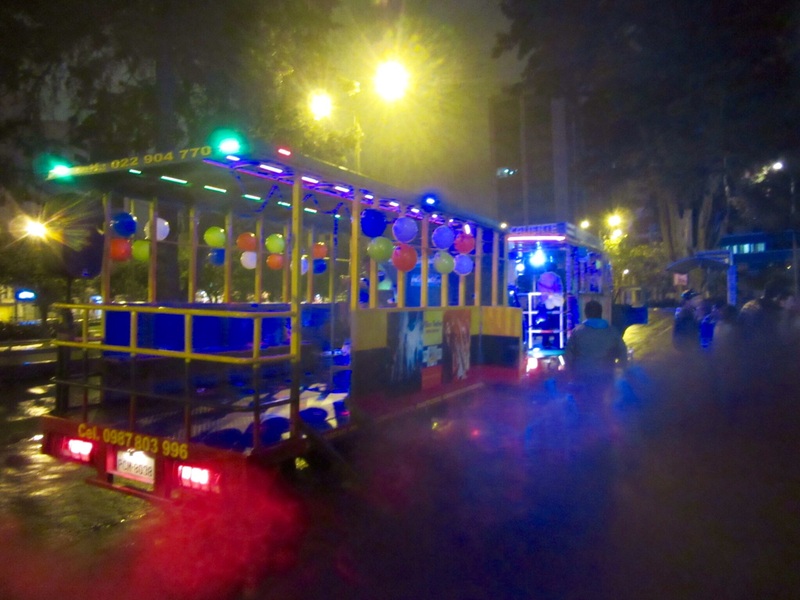 These are really converted cargo trucks with the beds outfitted to carry several dozen happy, loud, and wild revelers each. We were thankful for the covered tops, since it’s winter here and the night saw an off-and-on drizzling rain. The Chivas are a popular way for folks to enjoy club dancing without the clubs, cover charges, or buying drinks. 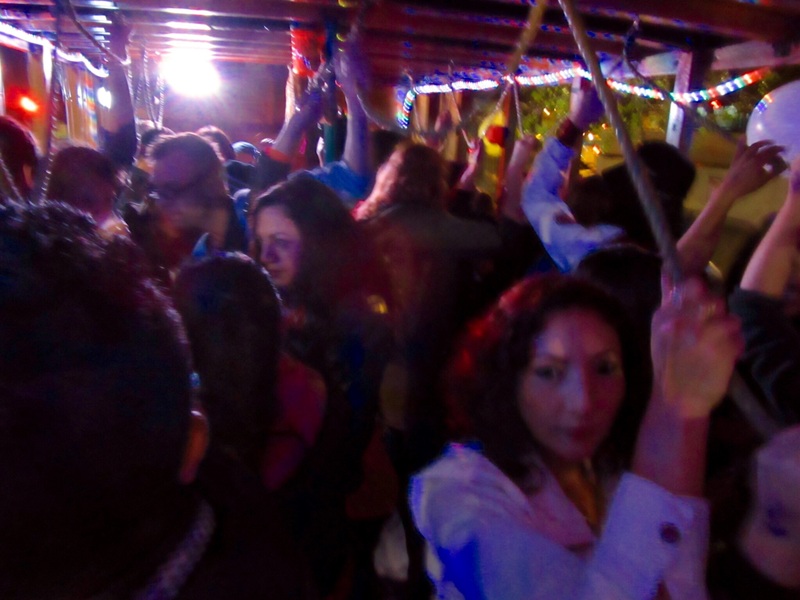 Everything is included in the $10 ticket; just hop aboard and cruise the city, and dance!. We eventually did stop at one of the parks, where all hopped off and danced along the sidewalks. Each of the Chivas had its own DJ and each had 4’ tall speakers announcing our musical progress as we snaked through Gringolandia (Mariscal Sucre) and Centro Historico for 2 hours. Lest you think that SAEX exists for throwing great parties, there really is more, far more. 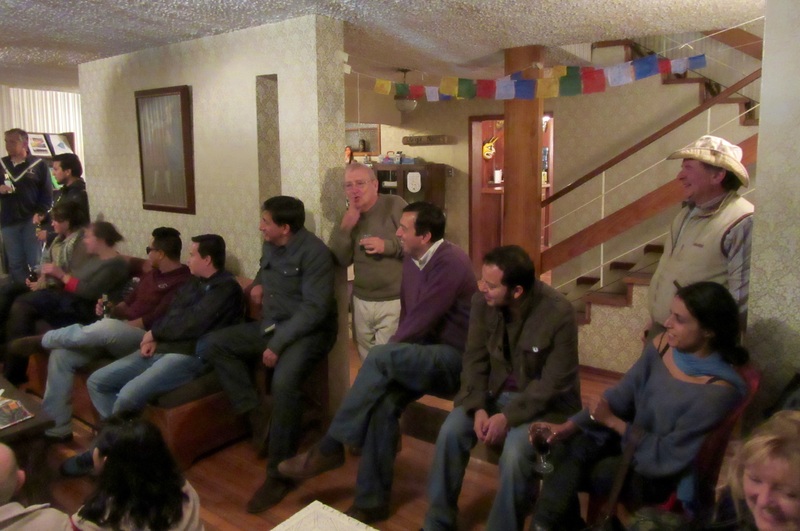 The Quito branch spent several years working with the federal government here to clean up the language school business. There are more than 200 language schools in Quito alone, with new ones coming as quickly as old ones shutter their doors. Many operate out of garages, and virtually all of them host impressive websites, snaring the young and unwary from afar. SAEX helped design a standardization process and the few schools registered with the national certifying board guarantee students a no-surprises education. When I first arrived, I rented a room here at SAEX and worked my way through their literature before choosing one of the qualified schools. When I leave here to move further north, I’ll use their guidelines to choose another language school in Otavalo. 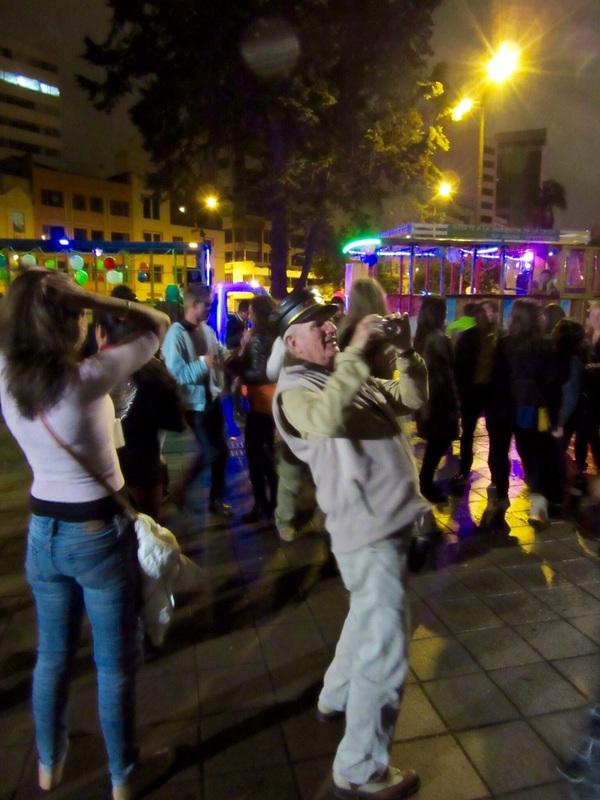 The club also supplies members with guidebooks, personal recommendations, and one-on-one instructions on how to live and thrive both in Quito particularly, but also in the country as a whole. Membership in the Club provides hundreds of discounted opportunities for restaurants, hotels/hostels, tour guides, travel agencies, theater events, and new offers that are constantly changing. Should the need arise, SAEX can recommend English-speaking healthcare options. I’m sitting here in the living room waiting to accompany several of the members who regularly see a dentist that they like. I’m ready for a teeth-cleaning visit and will join the other 2 for an unscheduled drop-in. More than 35 years ago the first Club opened its doors in Lima, Peru. Now there are 4: another Peruvian clubhouse in Cusco, a brand new one that just opened near Valparaiso, Chile, and this one here in Quito. The local clubhouse is run by John Caselli, a retired US Marine pilot and flight instructor. John provides clear direction both for day-to-day requirements, and also for long-term planning such as the language school standardization. If anyone has the vaguest notion of visiting South America, or just simply learning about one of the most fascinating areas on this planet, SAEX, with its $60 yearly dues, is a goldmine of information and a great way to meet some fascinating travelers and very curious and enjoyable Ecuadorianos. Next weekend the Club is hosting one of its many hikes that take place several times each month. You should join us. This entry was posted in Uncategorized on 2015-04-03 by kmalivuk. Have a nephew graduating from college next month and is applying to Peace Corp for Ecuador. Our family is very anxious for his safety. What is your in depth understanding, idea on Peace Corp duty there? Thanks for writing, and heartfelt congratulations to your nephew! I believe that he has made a very good choice and one that will provide him with both fond and beneficial memories for the rest of his life. Ecuador, and specifically the Ecuadorian people, love folks from the U.S. And since he will receive excellent language training from the Peace Corps, he will be able to communicate broadly when he arrives. Not many people here speak English, but Ecuadorians are both friendly and extremely polite. He will feel welcome upon arrival. As far as safety goes, Ecuador is a developing country, and as such he will seem to the everyday person as impossibly rich. My main advice would be to keep his smartphone in his pocket. Simply do not walk down the street, focused on that 3″ screen. Wait until he arrives where he’s going and then take out the phone. Wireless is everywhere, and cellphone coverage is generally excellent. But don’t flaunt wealth. Don’t wear an expensive watch. Do look people in the eye and say hello. This is a beautiful country populated by beautiful people who are more than willing to help him develop the strong love and pride they have for this amazing land. If your nephew follows common sense and travels with his eyes open, each day in Ecuador will be better than the day before. If you have more questions or specific concerns, please don’t hesitate to ask. We sincerely appreciate your valuable information and very helpful advice on living in Ecuador. Thank You Very Much! Grace and Family.